The Viking society of the seventh to eleventh centuries, when Viking raids and ocean explorations were at their height, was a largely pagan society with ancient gods who, believed the Vikings, needed to be appeased by crop, animal and even human sacrifices. The majority of the Old Norse sources about religion were created in Iceland, where the oral tradition stemming from the pre-Christian inhabitants of the island was collected and recorded in manuscripts. This occurred primarily in the 13th century. These sources include the Prose Edda, the Poetic Edda, a collection of poems from earlier traditional material anonymously compiled in the 13th century. Objects from the archaeological record may also be interpreted as depictions of subjects from Norse mythology, such as amulets of the god Thor’s hammer found among pagan burials and small silver female figures interpreted as fate or ancestor cults. Odin was the supreme god, the god of kings who presided over both heaven and earth. Vikings saw him as a war-like hero who rode the skies in his fiery chariot. It was Odin to whom a Viking warrior would offer a sacrifice before going into battle and it was he, they believed, who they would join in Valhalla, where all Viking warriors went on dying a hero’s death. In Norse mythology, Odin is the son of Yemin and the king of the Æsir. His eldest son is Thor, God of thunder. 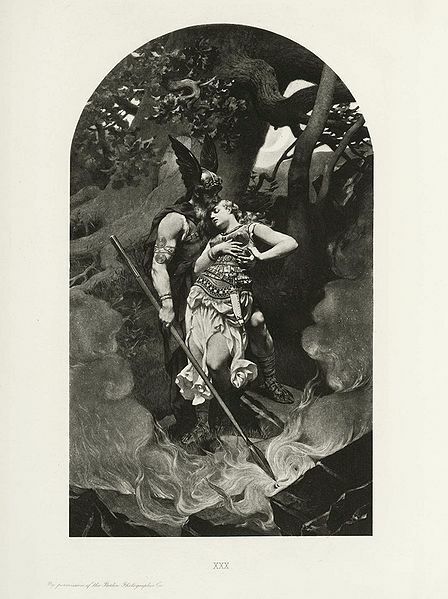 Depending of the territory Odin was named Wotan or in Old English his known as Woden. In old Norse he is named Oden. The name of the weekday Wednesday in English comes from “Wodens day” or in modern Scandinavia Wednesday is, “Onsdag”, from “Odens day”. Thor was, the Vikings believed, the son of Odin and a god of thunder who guarded the earth against dangerous giants. Thor’s symbol was the hammer, a design which was replicated numerous times on Viking jewellery and Thor’s name still appears in place names such as Thornbury and Thorness. He was well known for his fights with the race of giants. He was said to protect the home of the gods. In Norse mythology gods divided into two main category the Æsir and the Vanir. The Æsir are the main gods (Odin, Frigg, Thor, Baldur and Tyr). Important members of the Vanir include: Njord, the god of the sea and wind, Freyr, the god of fertility (crops) and prosperity, Freyja the goddess of fertility (child births), wealth, love, beauty, magic, and battle, Skadi, Gerd, Odr, Gullveig, Heimdall. The Viking sibling deities Freyja and Frey were beings of prosperity and fertility and were petitioned by humans to bring a good harvest, a happy marriage and successful childbirth. Freyja was believed to be able to turn herself into a bird using a magic falcon skin, whilst Frey stayed on earth tending to crops and controlling the weather. Tales of myth and legend were an everyday part of life in Viking society, with tales told around the fireside on a regular basis. Each god had its own personality and people would feel an affinity with particular gods, depending on their own character and situation in life. For example, a sailor or fisherman might pray to Njord, god of the sea, or a warrior to the god Tyr, the bravest of all Viking gods and the only one, it was believed, who dared to feed Fenrir the wolf and who had lost a hand doing so. According to a legend about the final days of the gods, there was an almighty battle in which almost all of the gods perished. Just a few were resurrected, including sons of Odin and Thor and a human man and woman who could then re-populate the earth. As Christianity gained strength in mainland Europe, the old Viking myths and legends were gradually replaced by tales from the Christian traditions. But for centuries, these gods inspired generations of Viking explorers, farmers, wives and warriors.